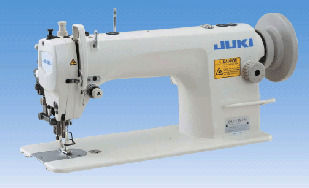 JUKI DU-1181N With Knockdown Servo Stand"
JUKI DU-1181N Single Needle, top and bottom feed with Variable Speed Servo Motor. Suitable for the production of baggage, suitcases, cushions, tents, sofas, leather products, canvas, and other heavy fabrics. With Knockdown Stand" Servo Motor Included. The lift of the presser foot, by the knee lifter, is as high as 15mm so as to support processes which require a higher lift of the presser foot such as piping and tape attaching. 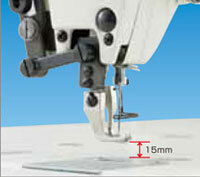 With its stitch length being as large as 9mm, the machine is applicable to a broader range of sewing processes. 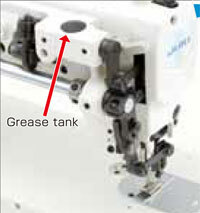 The machine comes with a horizontal-axis double-capacity hook, not only to decrease the frequency of bobbin thread changing, but also to enable sewing work with increased efficiency. 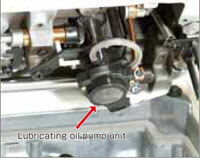 A pump-unit type automatic lubricating mechanism dramatically improves maintainability. The oil amount in the face plate and hook is adjustable. 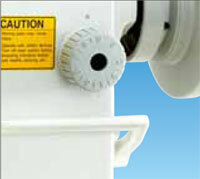 The top feed mechanism employs a grease tank and oil wick lubrication mechanism. The machine head is designed to achieve optimum balance, thereby reducing vibration and noise. The machine affords the operator a comfortable working environment. 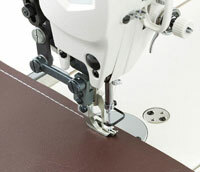 The stitch can be adjusted in both the normal and reverse directions. The height and inclination of the feed dog can be adjusted. The amount of the alternating vertical movement of the walking foot and presser foot is adjustable in a range from 2mm to 5mm according to the height of a multi-layered section of material. 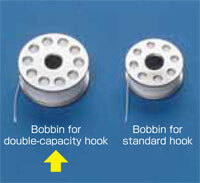 The horizontal feed cam, top and bottom feed cam and top feed cam can be adjusted after opening the rubber caps (three caps) on top of the machine head.